Every so often I’ll take a picture of something and sort of file it away because it doesn’t fit into any real category or post, and then it just sits there, so I decided to weed through some and finally put them up. 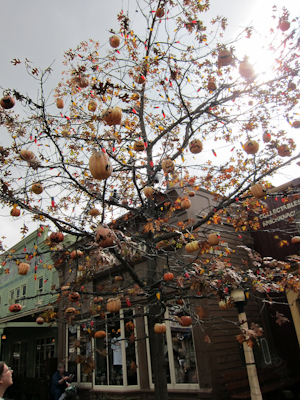 So, yeah, like basically a leaf-less tree hanging with pumpkins. I also took a picture of the accompanying plaque that identified this as The Halloween Tree and said something I can no longer decipher about Ray Bradbury wanted to have something in the park so here it is. Sorry, that was lame. 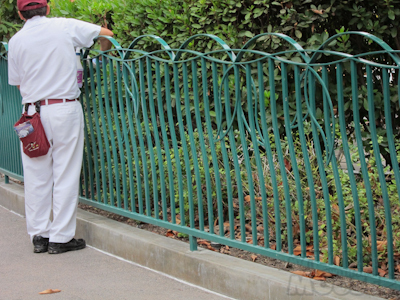 And equally lame is a picture I took of a guy cleaning the fence. If I remember correctly, I thought this was cool because the guy was actually dusting inside of those twisty things rather than, I don’t know, hosing it all down and calling it a day, which is what I would have done. Or actually I probably would have left it dusty, because I’m lazy like that. 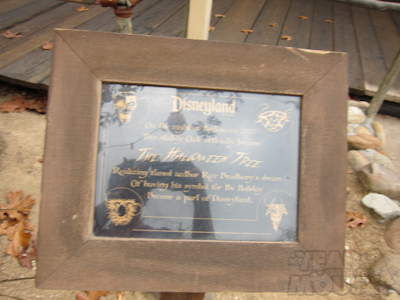 But just another example of Disneyland’s attention to detail. I really really REALLY want this. Should I treat myself? Please vote yes or no in the comments. 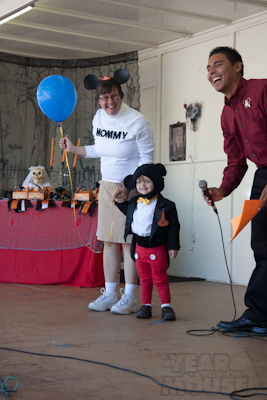 He didn't win this costume contest--we were robbed! 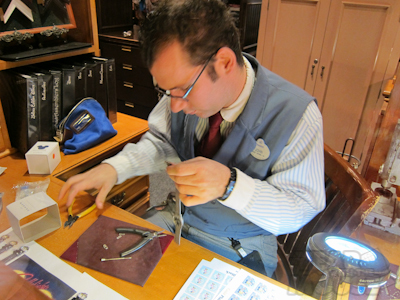 And over at the watch shop, the watchmaker was actually doing something with a watch! I don’t know if I could work in a fishbowl like that. The window faces out to Main Street. Any old weird person with a camera like me can just snap a shot. Oh, also I got a new phone which I’m kind of ambivalent about, but it does have good camera functions and has video recording. I thought I’d try it out tonight. Of course, it was only after I shot two videos that Kevin pointed out that if I held the camera horizontally, then Youtube wouldn’t cut off my video frame. Oops. Also, it was difficult trying to keep the phone stable so the videos are a bit jumpy. Sorry. First, the castle lighting. The video is long but pretty much all the action is over after 25 seconds so if you ditch out early, I’m not going to blame you. Also, turn your volume way down–we were standing right underneath a speaker. Also also, I tried to rotate it in Youtube so it isn’t sideways, but at the time of this posting it was still “updating” so we’ll see what it looks like in the morning. If it’s still sideways–well, lesson learned. This video is even less exciting. We were standing near the Hungry Bear restaurant by Splash Mountain to watch the fireworks. The interesting thing I think is that when they moved the fireworks focal point to the castle and started doing castle effects, if you’re standing on Main Street or in the hub the fireworks all look like they’re directly behind the castle. However, from this angle you can clearly see the difference between the high fireworks being shot off the backlot and the low fireworks (on the right) at the castle. Also, keep your sound turned down here too–the fireworks are a lot louder in that area than in other areas, it seemed. And there’s your miscellany for the day. 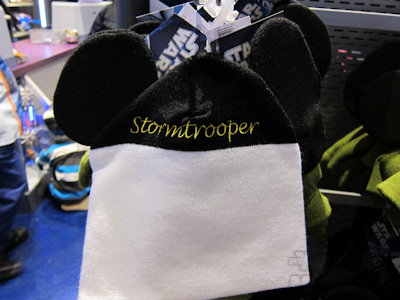 yes, buy the stormtrooper mickey ears (one for you and one for me)! Hee! I just think they’re so funny! 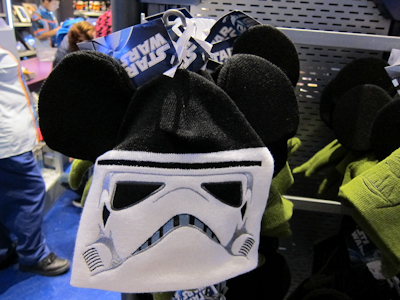 Another vote for the Stormtrooper Mickey ears! They do have an R2D2! They’ve also got a Yoda. I just think this one is the funniest :). Yes, get them! And when I’m there I’ll get all three!